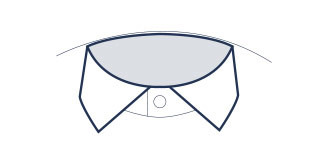 We offer a superb range of traditional and contemporary collar styles across our shirt ranges at Charles Tyrwhitt. An excellent shirt collar frames a man’s visage, flatters his facial shape and complements his outfit. There’s no need to be an expert on the subject (after all, that’s our job, not yours), however knowing a thing or two about collars will go a long way towards helping a gent look his very best. The collar band refers to the section of fabric that encircles your neck. These are the tips of the collar, on each side of your tie. 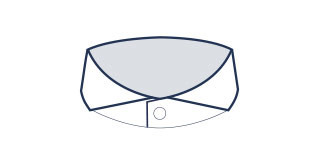 The distance between the two collar points. The distance from the tip of each collar point to the collar band. 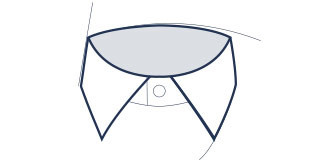 This is our most traditional collar shape, and a staple of the Tyrwhitt shirt collection. While the classic collar is particularly flattering for larger faces, it will suit all shapes and sizes. This collar looks dashing with a four-in-hand tie knot, however almost any tie knot will sit beautifully. 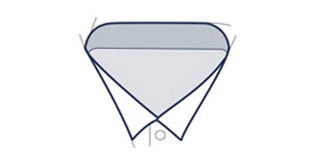 A cutaway collar has wider collar points that are angled outwards instead of pointing down. It suits men with slim or long faces, or anyone who appreciates a modern twist to traditional attire. Team the cutaway collar with a full or half Windsor tie knot, among the easiest tie knots to master. This collar can also be worn without a tie. Like the name suggests, this collar is halfway between our classic collar and our cutaway collar. We use the semi-cutaway collar mostly on our business casual shirts because it’s so easy to dress up or down. If you choose to wear a tie, opt for a larger knot like a half or full Windsor, since the wider spread of the semi-cutaway collar means more of your tie knot will be visible. The extreme cutaway collar is our most widespread collar, with tips cut away and facing towards the shoulders rather than down. It particularly suits those with narrow faces, as the longer collar points can balance out a gent’s proportions. Pair this collar with a slim tie and a small tie knot. 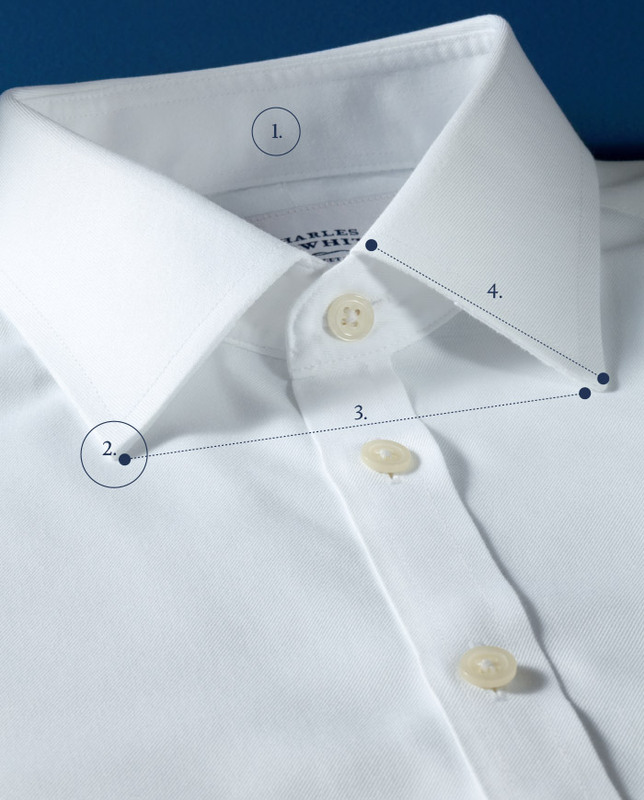 Each side of this collar is fastened to your shirt with a button, keeping it firmly in place. The button-down collar can be worn with or without a tie and therefore is easily dressed up or down. A little softer and more casual, a button-down collar looks great worn with a smart blazer at business casual occasions, but this collar works just as well on a formal shirt in a contemporary setting. The wing collar is designed specifically for an evening shirt, and should be worn with a bow tie and tuxedo. Rather than collar points that face down, a wing collar’s tips sit flat, resembling wings. 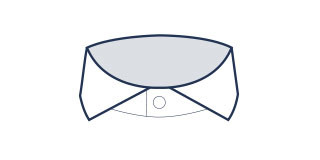 Shirts with wing collars can be worn to black tie events, weddings, and other formal occasions.